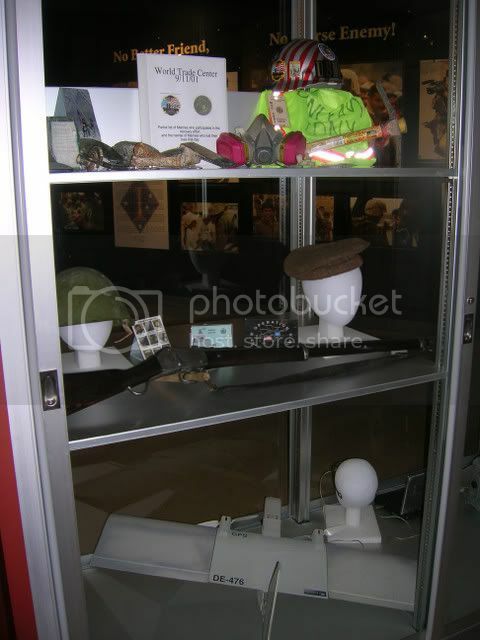 They recently added some glass cabinets to the Global War on Terror Gallery. This surprised me as they are going to be taking the gallery down this summer to start construction on Phase 1A - - which I will have to share the scoop on that with you all. The glass cabinets are being tested and at the same time they are housing some "micro" artifacts from the wars in Afghanistan and Iraq. 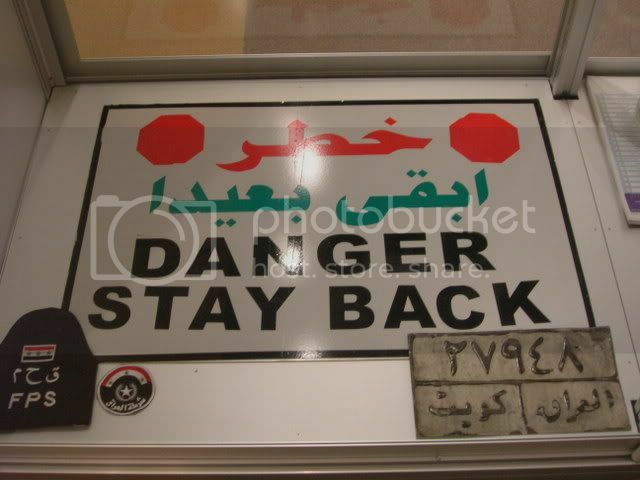 Above, is Danger sign that I assume would be at a check point or something. 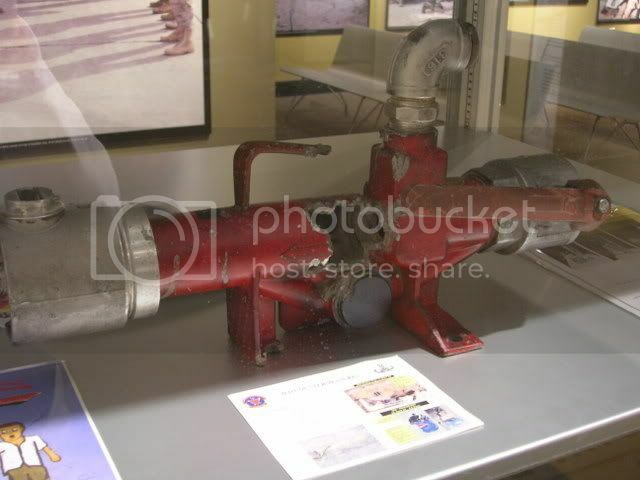 Below, is an IED (improvised explosive devise) that EOD (explosive ordinance disposal) was able to disarm. Around it are various leaflets that are handed out to Iraqis trying to entise them into telling US forces where the IEDs are. 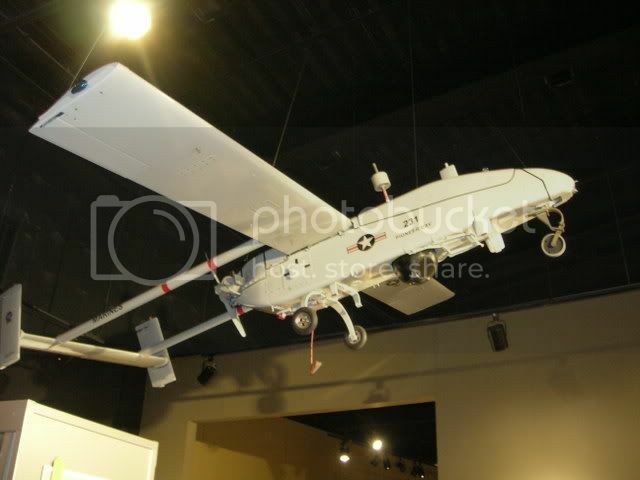 Above is an unmanned aerial vehicle. In the case below, you can see a smaller UAV. At the beginning of the wars, there were about 300 of these, now there are over 3,000 in theater - - and that many can't even meet the demand. These provide aerial observation, and in the case of some vehicles such as the Reaper and the Predator, they can be armed with missiles. Every year, according to an article I read, the demand from the boots on the ground for UAV coverage has gone up 300%. 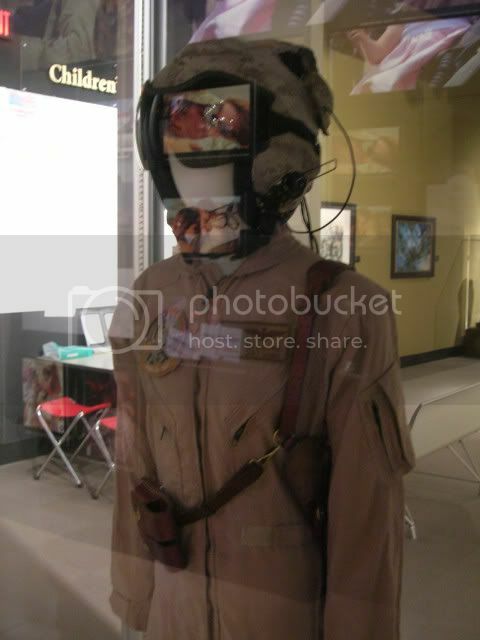 Lastly, is a pilot's uniform. Now a days its difficult to tell infantry from pilots as everyone wears the flame resistant flight coveralls.